Summary: Staging your backyard doesn’t have to cost hundreds of thousands of dollars. Here are some simple tips on how you can do this on a tiny budget. More often than not, the home’s interior will be the primary focus when it comes to selling the property, but it’s important to remember that the exterior is just as important. 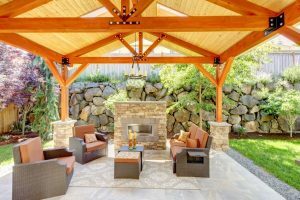 Now, a well-kept backyard may even go as far as sealing the deal with a buyer, as well as nudge prospects that are currently on the fence. Before you go ahead and call every contractor that you know so you can start the overhaul, know that all it takes are some simple staging techniques that can provide a similar impact to the thousands that you’re about to spend with an excavator. Keep clutter away from sight. Any scattered toys, garden tools, and junk should be stored in a bin during the selling process. It’s important to get rid of yard decorations and other items that have outlived their usefulness. They’re not just unattractive, but they can also completely turn off a prospect. Every patio or deck has some type of furniture piece sitting on it. While the patio itself might look gorgeous, the furniture pieces could take away from the overall aesthetic of it. Be sure that any old broken down furniture pieces are either discarded or hidden away from sight. Remember, buyers want to envision what it’ll be like when they start moving their belongings in. Arrange your backyard in a way where it takes on a versatile appearance. For instance, you can set up a hammock in a back corner for a cozy reading area. Or, you can leave an open area in the middle of the yard to show buyers that they can have a play area for kids. Buyers love to imagine the opportunities and possibilities when there’s a blank canvas in front of them. Blog submitted by Wicker Paradise: Wicker Paradise is your home for quality replacement cushions, wicker furniture pieces, and more. Visit them online today and explore their wide array of products.